My brother-in-law, John, has a way with cocktails. In searching for a fresh drink last Summer, he threw together this baby. After intending to try it out for at least a year, my husband and I finally got to try it out from the creator himself on a recent trip back to New York. Sure enough, this drink lives up to its reputation. There are several ingredients in this drink that I find, even independent of each other, add a little extra ‘something’ to whatever cocktail they are in. 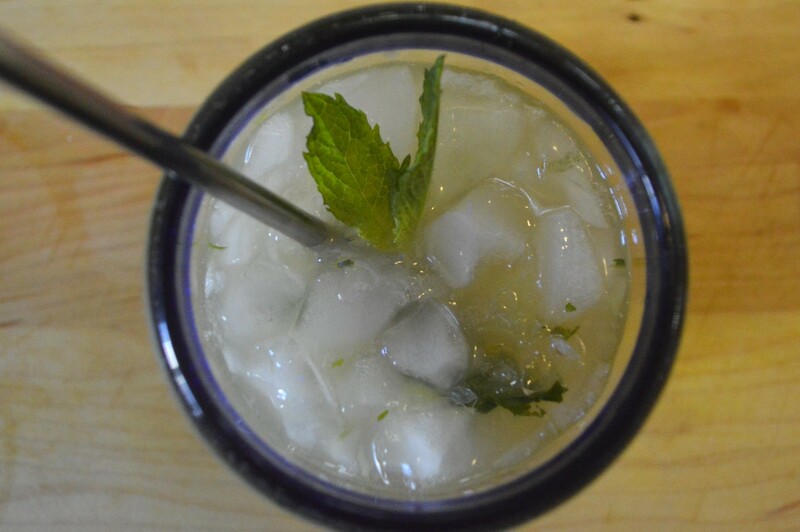 Mint – fresh mint is so flavorful that mojitos and mint juleps don’t call for all that much else. When is the last time you could resist one of those? Cucumber – a hip cocktail trend several years ago, I still love me a cucumber drink. 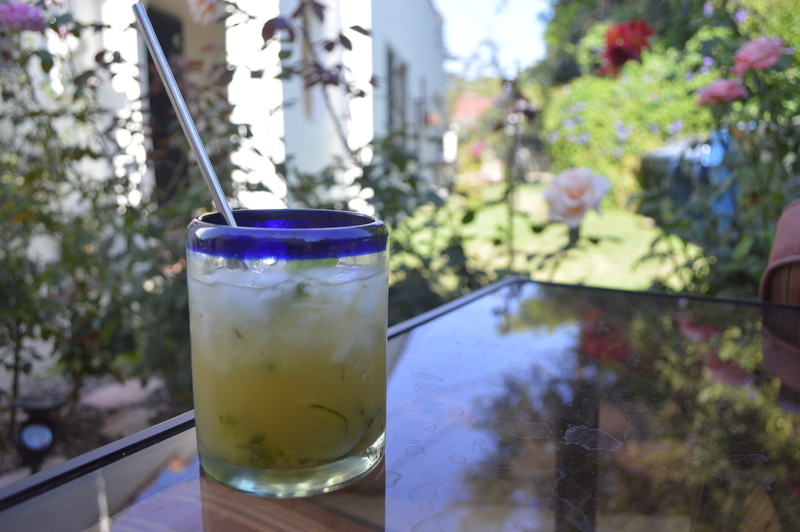 It makes a libation so much more refreshing, with an innuendo of spa-style cucumber water. 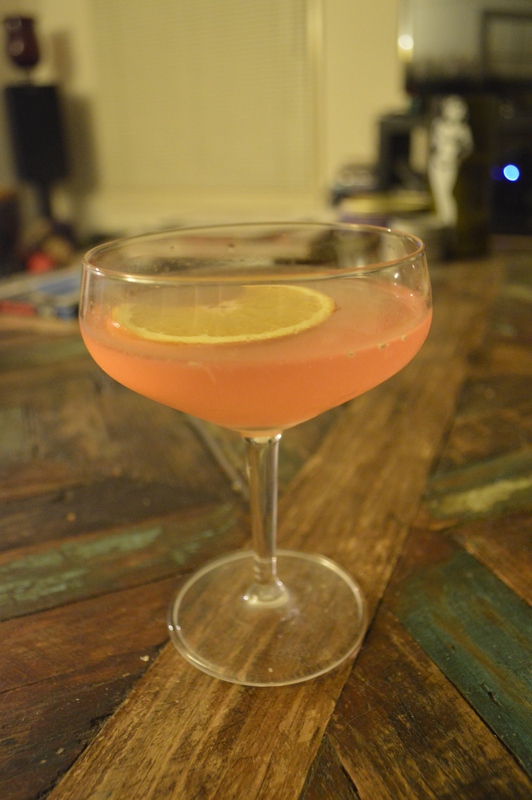 Grapefruit Juice – My good friend Cassie introduced me to the Greyhound cocktail, one of my favorite well drinks. All it calls for is vodka, grapefruit juice and ice. Not only is the grapefruit juice tart and bold, but it also can mask cheap vodka in a pinch (if, let’s say, you are getting free drinks at the fabulous Gold Nugget in Las Vegas, and want to avoid the rubbing alcohol taste of Vodka-brand vodka). Combine them all, and you have a sure-to-please cocktail for those who love plucky flavors. Why not try it tonight? 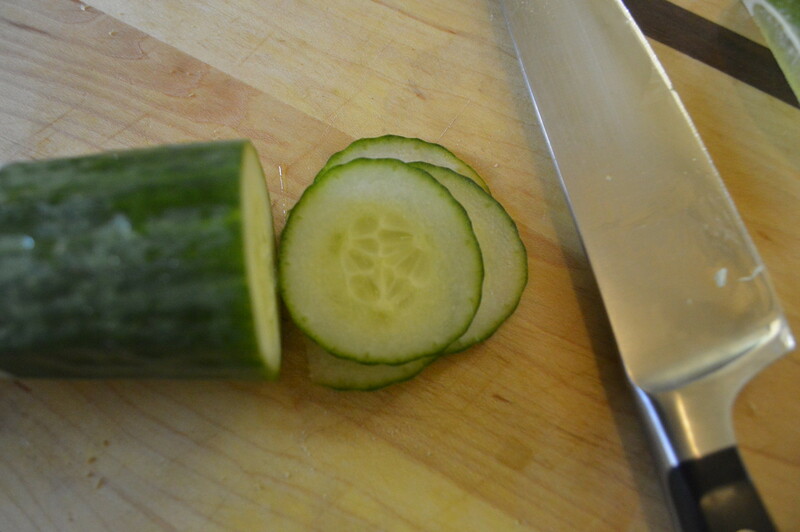 Thinly cut 4-5 slices of cucumber. 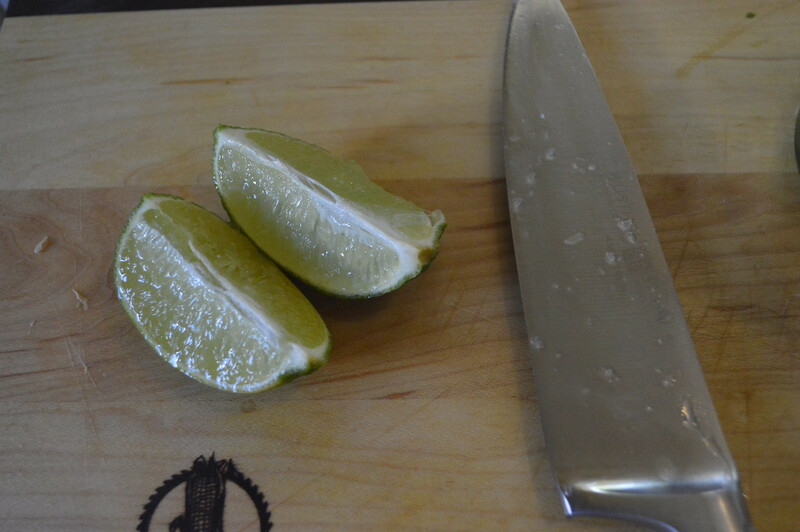 Cut a lime in half. Add cucumber and 4-5 mint leaves into a glass. 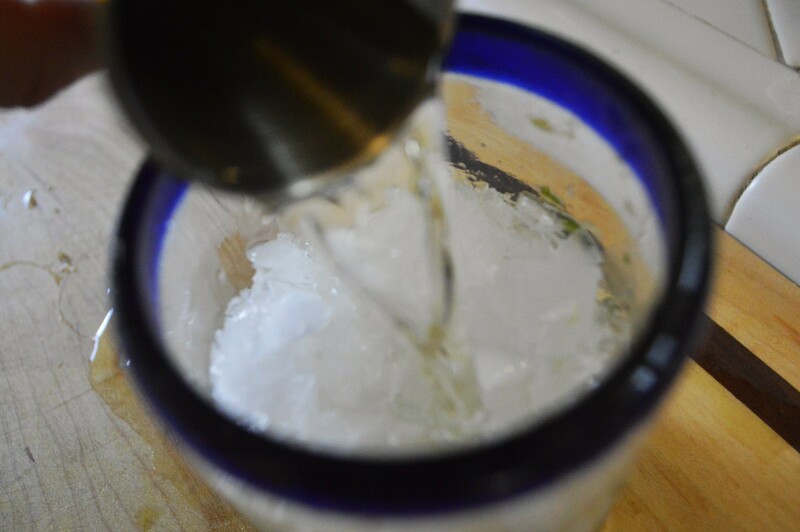 Add the juice of your lime, sweetener of choice and muddle fervently. Get your tequila ready. Tactfully ignore that you are almost done with a Costco-sized bottle. Top the cucumber mixture with ice and pour tequila over the entire concoction. Add grapefruit juice and stir vigorously. Add several small mint leaves for garnish. And there you have it! 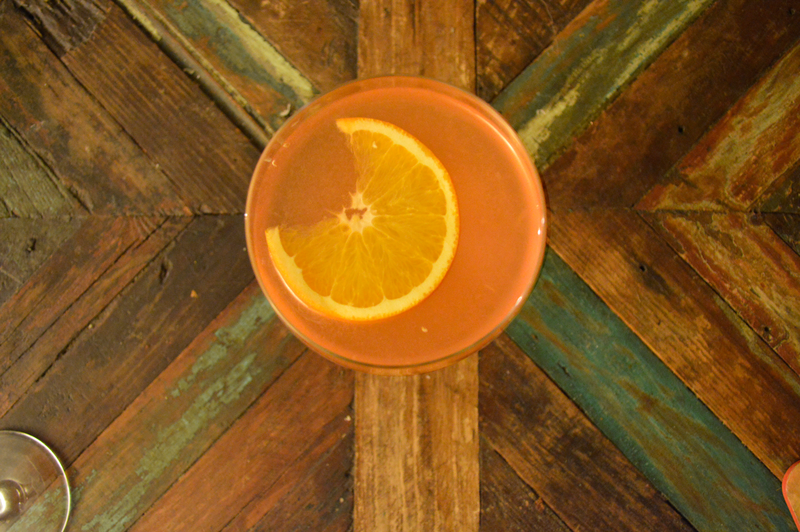 Tart, refreshing and the perfect Summer drink. 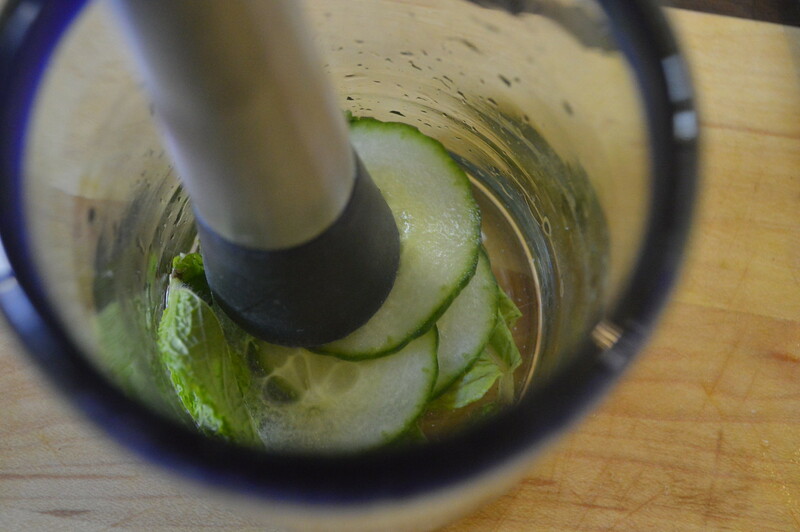 Muddle the cucumber, mint leaves, lime juice and sweetener together in a glass. 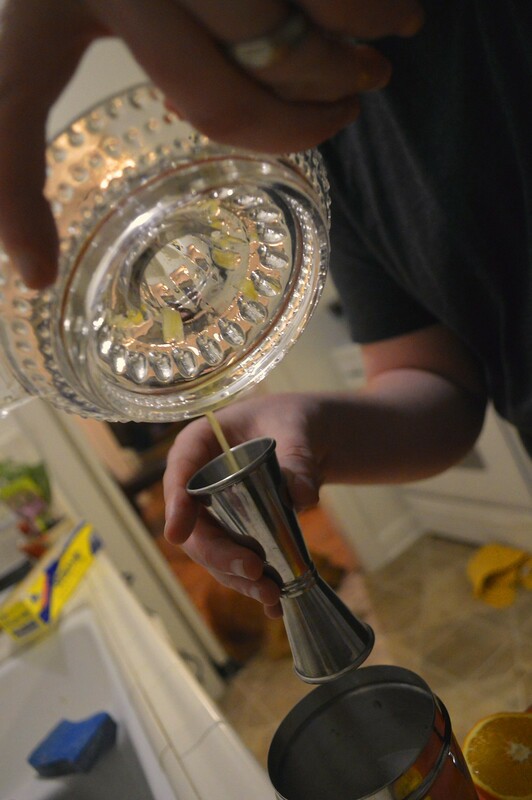 To quote John, “Dear God man, MUDDLE.” Get it nice and integrated. 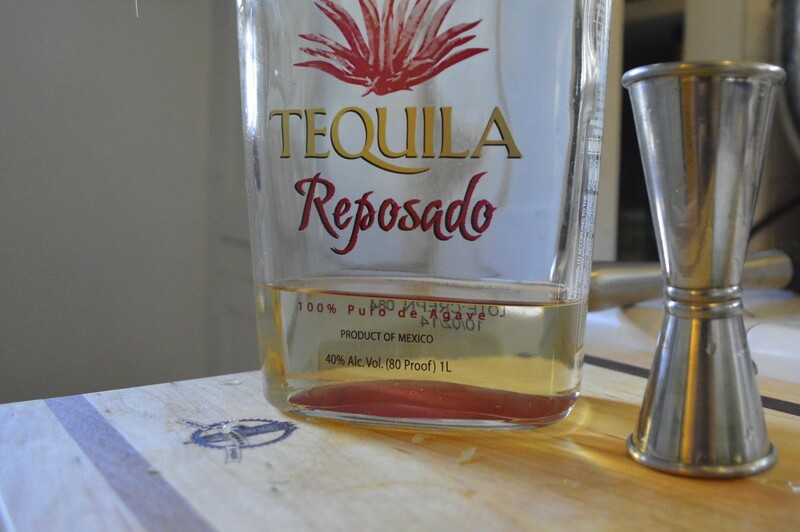 Add ice to the glass, then pour in tequila and juice. Stir it up heartily for about 30 seconds and enjoy! TIP: If you don’t have a muddler, just use the blunt end of a spoon. 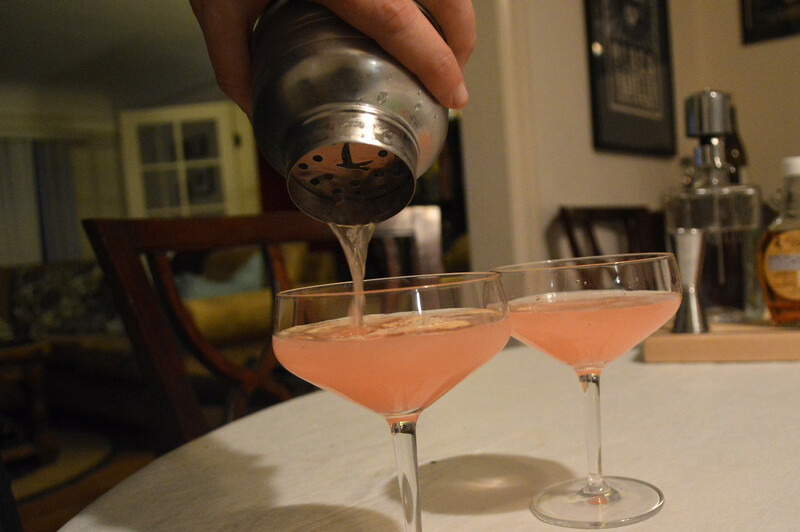 I’ve even muddled a drink with a drumstick – anything long and blunt shall do. TIP 2.0: This is easy to make in a pitcher – just multiply the above by however many servings you are after, nix the addition of ice, and stir for some time longer. If the pitcher is sitting for some time, stir again before serving. Feel free to add minimal ice to the pitcher to chill it, but pour over fresh ice while serving so it does not get watered down. Howdy, folks! It’s Abbey, Dana’s friend and neighbor. We recently threw a party for my son’s first birthday, and Dana asked me to guest write about it. A little background - Dana and I have lived as neighbors since 2011, when she and her then pre-hubs showed my husband and me their amazing new apartment and informed us when another duplex on the property opened up. The property layout is hard to explain, but suffice it to say that we share a backyard. Was this the best decision of my life? I’d have to make a Google Doc spreadsheet to analyze officially, but I present the following evidence. 1) All of that wonderful food you see Dana posting?… well, we get to eat that. Pretty regularly. 2) Their hospitality extends to the beverage world. Dana’s cocktail prowess alone should sway this argument, and then factor in Ryan’s fantastic homebrews to the equation. To my kid, all dogs are called "Doo!" 4) We get all of the benefits of actually living in proximity: borrowing stuff (cup of sugar, lemons, electric drill), sharing oversized quantities of foodstuffs procured from Costco or our produce subscription box, retrieving mail on vacations, just stopping in to say hello. We should have a sitcom. 5) Multiply this x10 during my pregnancy and immediate post-pregnancy days. I can’t tell you how hungry I was and how many times they fed me. I think I can skip the spreadsheet. Anyway - my son’s first birthday party. No pressure, right? Honestly, I’m on the side of the fence of smaller-is-better for kid’s parties, partially because mine were pretty small as a kid, but also because I’d like to leave some room to grow over the years. And also bear in mind (ha! ), our families are in many different states, so I’m not trying to accommodate different sets of grandparents, aunts, uncles and cousins. BUT that doesn’t mean it can’t be cute and have a theme. Homemade or smartly purchased is my game, since I also don’t want to spend a ton. I thought of asking Alex, my husband, for theme ideas, since I was raised with just sisters and didn’t have a ton of boy themes in mind. Then I remembered he wanted “dinosaurs in space” as the theme for my baby shower, and thought the better of it. I picked bears. Why? Well probably because we call Bruce “little bear.” I don’t know why or when it started, but it seemed to fit. It also helped that we love the woods and happened to have a few Adirondack/bear themed knickknacks hanging around the house. Even tissue paper. So that was good. The rest I was able to cobble together from the craft store- just paper and fabric. 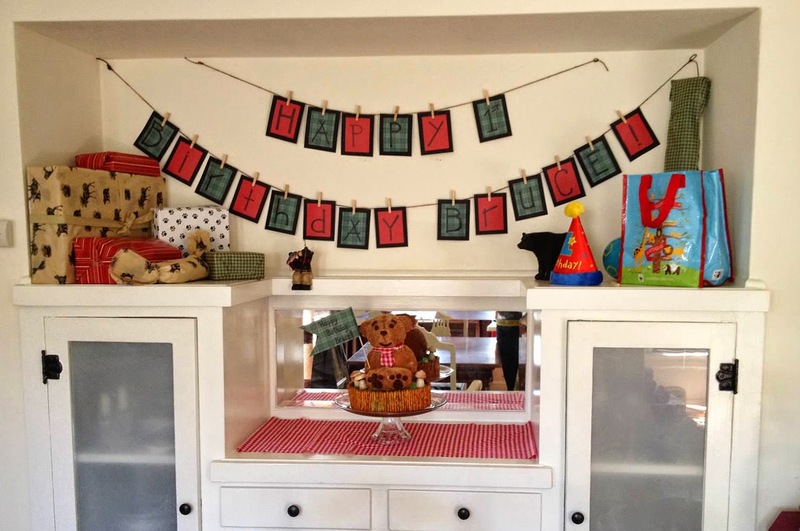 Apparently you're breaking the law nowadays if you don't have a homemade banner for your child's birthday. And the cake - I must confess, I have strong opinions when it comes to children’s party themes (or any cake, for that matter.) My mom spoiled my sisters and me with really great cakes when I was a kid. Carefully constructed carousels, elephants, a Sphinx for my sister’s 9th birthday… It was many years before I figured out that was not the norm. Anyway, I knew that for Bruce’s first birthday, it had to center around a great cake. 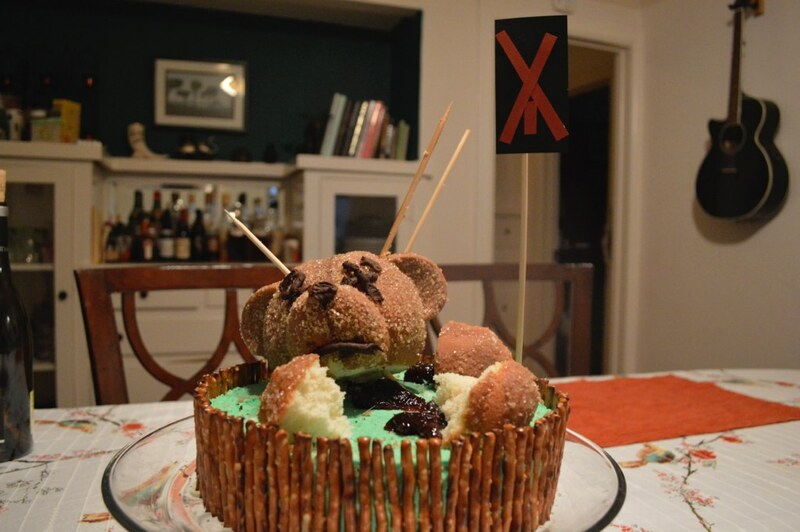 I didn’t want a cutesy itsy-bitsy baby kind of bear cake, but more like the Adirondack-style bears I’d seen. If I had been making this a few years ago for a friend, I probably would have sketched the whole thing out and constructed this myself. But being on the other side of parenthood, I searched the internet for a pan. Yes, a uni-tasker (sigh). But then I found this. The Build-A-Bear cake pan from Williams Sonoma. Even better, it already had instructions for the cake batter (though I used Smitten Kitchen’s Vanilla Buttermilk Cake recipe) all the way through the buttercream and decor. Score! Homemade but something I didn’t have to carefully plot out first. Mr. Bear was a pretty good success. I stayed away from the fondant clothes, because in general, I’m not a fondant fan. I did need to cover up Mr. Bear’s middle seam, hence his tie (yay fabric remnants and a glue gun!) That Vanilla Buttermilk Cake recipe filled Mr. Bear’s pan and a single 9” layer (later split) perfectly, so all I did was triple the buttercream to fill and frost. Added some last minute touches like these meringue mushrooms I had already made for party food and a decorative flag (since, oops, I forgot to leave space to write in the frosting). Mr. Bear was also tiered and the extra skewers helped hold him in place. Meringue mushrooms were something I made all the time as a kid. Again, my childhood was not normal. Pretzel sticks, honey sticks... we're in the woods! Get it?!?! Of course, I can’t have a party without employing Dana. She and Ryan headed over early, guessing that I might need a little help (who, me?) Ryan was nice enough to man the grill for burgers and Dana took care of smoked salmon hor d'oeuvres, drinks, and even photography. What Dana makes when Abbey throws ingredients her way and says "make it pretty!" Our little bear seemed to enjoy it. Don’t worry - I did this out of sight of Bruce. But transforming his birthday cake leftovers into a festive and rethemed Father’s Day cake did feel pretty scandalous. (Who said being a parent didn’t have it’s perks!) Perhaps even one day (18th birthday?) Bruce will get to see what really happened to Mr. Bear. I didn't used to like Bobby Flay. Something about him came off as brash and arrogant, and none of his food looked too appealing. Sure, he went to Ireland to film a special, and that was pretty cool, but I was staunchly anti-Flay. Then something happened to crack my aversion. 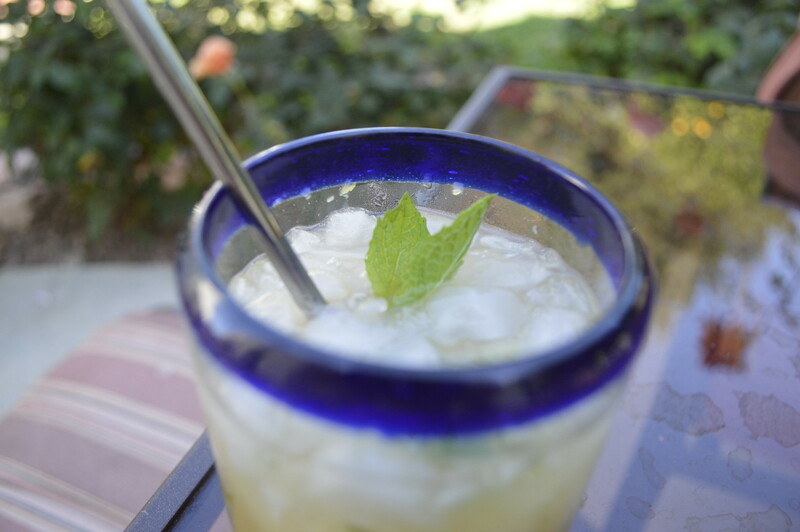 A magical something, in the form of his White Peach Sangria. I freehanded a version of this for a housewarming party some time back and, well, let's just say it packed a wallop. This recipe is extremely delicious, and worth the extra effort into preparing the peach puree. But it wasn't the recipe that got me to warm up to him. It was the spectacular video of Mr. Flay preparing this sangria in which he is undeniably sloshed. I implore you, watch this video and bask in the final shots of him sloshing the sangria everywhere and freehanding fistfuls of fruit into a glass. He opens the video by slogging back drags directly from the bottle, for crying out loud. And that is AMAZING. A sneak peek of the action. Some years have passed since then, and I have discovered his new show "Brunch at Bobby's." True, the opening sequence is utterly bizarre, with a disembodied hand throwing an egg at Bobby (prompting slight callbacks to the backlash he got during the January Jones scandal). Outside of that, this show is super solid. You will marvel at the many variations of a frittata, and interesting-yet-manageable takes on brunch dishes that will look so mouth-watering you will actually get up early on a weekend to make them. And if menu items like Lemon Ricotta Fritters with Fresh Berry Jam or Chorizo-Potato Hash Browns with Black Beans and Salsa Verde don't get your motor running (impossible! ), he also makes a brunch cocktail (or on occasion, mocktail) in each episode. They always look gorgeous and citrus-y/sweet/fruity enough to be deemed a 'brunch' cocktail. So, last night, when Ryan and I were preparing to eat Smitten Kitchen's insanely satisfying Spinach and Cheese Strata for dinner, technically a brunch dish, we thought it would be fun to make one of Bobby Flay's brunch cocktails to pair with it. Good gravy, this cocktail is good. I mean really good. Like, wanting to put a brunch on the books ASAP to share this drink with friends good. The brunch-y cast of characters. 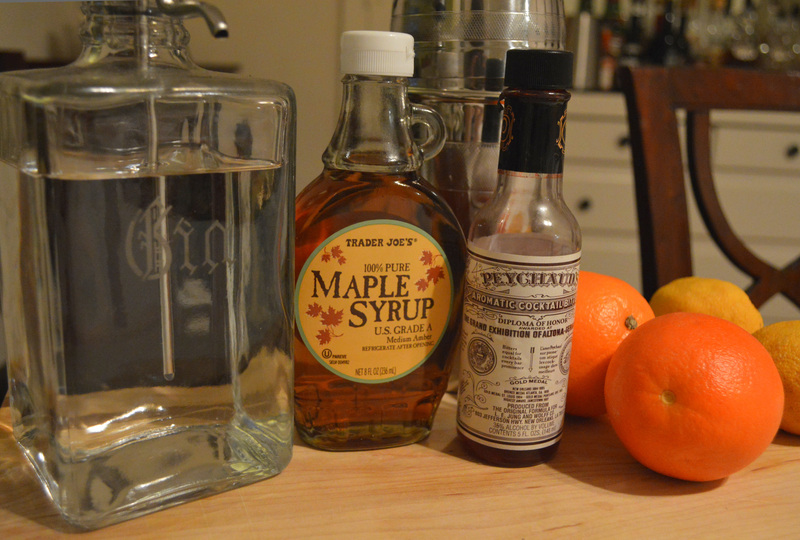 It has fresh orange and lemon juice, as well as maple syrup, bitters and gin. I'm not nuts about gin and have an aversion to overly sweet cocktails, but this is perfectly balanced. If you worry about your cocktail being cloyingly sweet, rest assured that the syrup is only an accent. Also, note that it is important to use freshly-squeezed orange juice, as it makes the cocktail taste crisp and refreshing while avoiding the added sugar in the store-bought variety. So let's take a journey through this cocktail together - who's thirsty?? Backyard picnics totally count. Dogs love 'em! This blog post was inspired by a friend, the lovely Molly, who was on the hunt for a dish to bring to an Independence Day picnic. Really, is there anything more Americana than spreading out a tablecloth in a park and digging into a portable feast? Sometimes, though, packing everything up and driving to a location outside of your living can seem like a ton of effort. The allure of the AC can easily tempt an otherwise avid picnicker away from their gingham. To help provide extra motivation to get out and about (myself included), I have organized some of my favorite picnic spots, menu-planning tips and recipes to make the prep minimal and the fun maximized. Comments and other favorite recipes are very welcomed, so please comment below if there is anything you would like to add! The main ingredient in a good picnic is a scenic setting. Or wine. One or the other. In case you are looking for some fun places to take your outdoor feast, here are some places to try out. After our wedding and the generous gifting of friends and family, I now actually have three beautiful picnic baskets in my possession. There is something impossibly charming about thick plastic, washable silverware and plaid napkins (not to mention straps to lock down your plastic wine glasses). 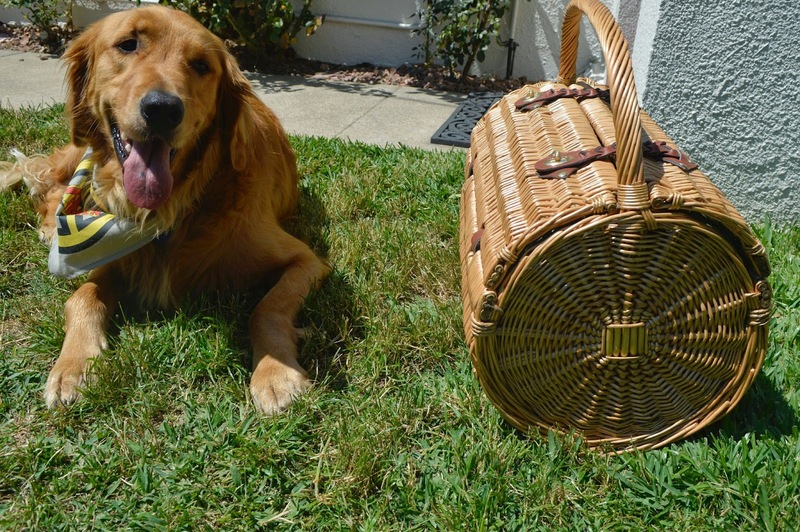 Of course, a picnic basket is not strictly necessary for a picnic. Heck, it can even be a hazard if you are attempting to picnic in Jellystone. Reusable shopping bags work just fine, preferably the insulated type to ensure food is kept fresh and at safe temperatures. For your picnic planning convenience, I have put together an outline of a sample spread that would feed a hungry group of 6. Note that I have Italian blood in my veins, so this errs on the side of more vs. less. Water bottles all the way! Make it easy on yourself and get a bunch of ready-to-go water or bring your own reusable bottles from home. Plan for at least two medium-sized bottles per person. It may be heavy to carry in depending on your ultimate destination, but better to have too much water on a hot day than not enough. You know your friends and their drinking style (er, quantities), but I would plan for roughly 3-4 glasses per person depending on how long you are going to be out. Wine is a natural picnic libation, although many parks will not allow you to bring in glass. Fortunately, despite the chagrin of high-end wine lovers, there has been a steady influx of boxed and pre-portioned wine meant for glass-free environments. I love a brand called Bandit Wines. This wine provides a great bang for your buck, and is even served at respectable eateries like Gott's Roadside in San Francisco (a fact that can be provided lest a friend tease your wine's boxed packaging). Bandit's Pinot Grigo is my choice for hot Summer days. Make sure you have it nice and chilled before you leave, and try to keep chilled in an insulated wine pouch. If you are feeling extra festive, Pinterest is a treasure trove of great sangria recipes. One of my favorite boozy party tricks (that works perfectly fine at home, as well) is, if you want to keep a sangria cold for a long period of time, fill an ice cube tray the night before with the wine you are using for the sangria. The cubes won't freeze all the way, but will be just chilled enough to keep your beverage nice and cold without watering it down when the cubes melts. This sandwich is fantastic for an outing as it is fast to make, and very simple to scale either larger or smaller depending on how many people you want to make it for. It is tangy and refreshing. I don't recommend a portion of chicken per-sandwich as it all really depends on the size of your bread and your personal preference. Using two forks, tear the entire chicken into thick shreds and place into a bowl. Scoop enough pesto sauce into the chicken so that it fully coats each of the shreds. Lay out the bread, and spread a light layer of mayonnaise onto each slice. Scoop chicken onto 6 slices of bread, and grind some pepper onto it. Top with other piece of bread. You may have chicken leftover (but is that really such a bad thing)? Wrap tightly in butcher paper or foil. Add the cheese and garlic, and pulse until all broken down to your desired consistency. If you have the option with your food processor, drizzle the olive oil in slowly while you pulse so it all purees correctly. My food processor does not present this option, so I just add a little at a time until it has the desired consistency. It may not include the entire 3/4 cup olive oil if done this way. Salt and pepper to taste. My hubby likes to cook, and I happily get to benefit. He whipped this up last week based on other corn salads that we have enjoyed previously. You can substitute with whatever you have on hand, such as shallots or yellow onion for red onion, arugula for cilantro, etc. Rub the butter on the corn, and then grill the corn on a very hot grill pan or barbecue. Once tender to the touch, remove and let cool a bit. Using a sharp kitchen knife, hold the ear vertically and cut down (away from you) so that the full kernels of corn come off. Transfer to a bowl. 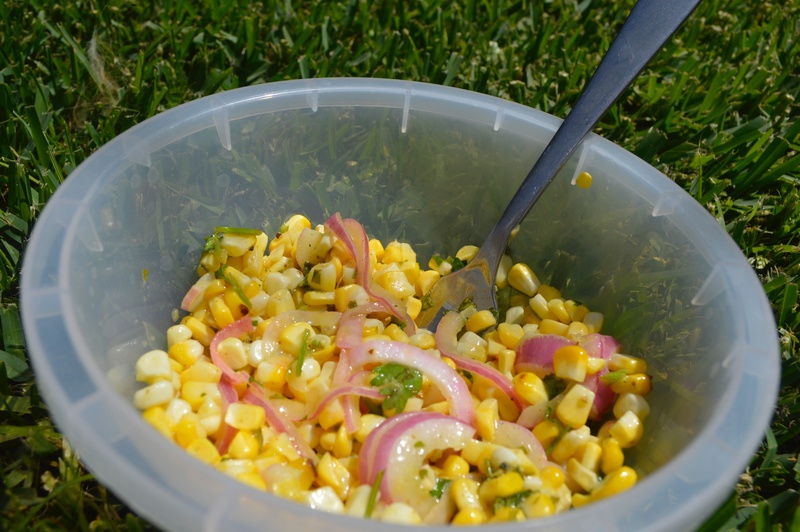 Toss corn with thinly sliced red onion and the cilantro. Add vinegar and salt and pepper to taste. This tomato salad is very bright and satisfying, from a cookbook filled with recipes that embody all things bright and satisfying. For those who live in LA, you may be familiar with the Lemonade restaurants' fresh fare. This cookbook is a good investment for those interested cold salads and unique vegetable side dishes. Cut the bigger tomatoes into 1/4-inch-thick slices and quarter or halve the smaller ones; this vegetable salad looks great with different colored tomatoes of varying sizes and shapes. Put the tomatoes in a mixing bowl and pour in the vinaigrette. Toss gently, taking care not to smash the tomatoes. Sprinkle in the basil leaves. Season with pepper, and toss again to combine. When ready to serve, sprinkle with fleur de sel. Serve at room temperature. In a blender, combine the basil, parsley, lemon juice, oil, salt and pepper. Blend on high speed for about 1 minute until smooth and green. Pour the vinaigrette into a container and keep any leftover covered in the refrigerator for up to 5 days. This recipe is really simple to make, and a go-to picnic favorite for us. It is bright and fresh-tasting, and by far one of the healthier options for a pasta salad. Please click through to the above link to check out the other great recipes and picnic tips! Bring 2 large pots of water to boil. Add a big pinch of salt in each. To one pot, add asparagus and blanch, about 2 to 3 minutes, depending on the thickness of your asparagus. Place blanched asparagus in a bowl of ice water to stop the cooking and keep them green. To the second pot, add the orzo. Cook per package instructions. When tender, drain and place in a large bowl. Add blanched asparagus and tomato halves. Mix olive oil, lemon zest, lemon juice, garlic, salt and pepper in a small bowl. Stir into orzo and vegetables. Stir in parsley and grated Parmigiano Reggiano. This can be served warm, room temperature or cold.